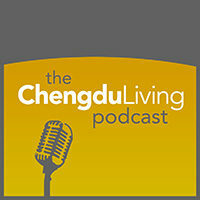 My iPhone is always in my pocket and has become an invaluable tool for life in Chengdu. I’ve used it for learning Chinese, managing daily tasks, finding my way in China, and so much more. As each year passes, it becomes more and more capable, but the truth is that it’s nothing without the apps that I have installed on it. I’ve tried and tested hundreds of apps which which make life in Chengdu easier, and these are the cream of the crop. My essential China apps. Most of these are universal apps that work for both iPhone and iPad, and they’re all free. Nearly all of the apps listed below are on Android as well, with the exception of the China Air Pollution Index app. This is the absolute best Chinese dictionary app you will ever find. There simply is no greater. It’s available for free, with paid add-ons which add dictionaries or features like intelligent flashcards, the unbelievable OCR feature (which I’ve written about before), and much more. Pleco is easy to use and includes features like color-coded characters which help you remember tones. It’s in simplified and traditional Chinese and its feature list includes everything you really need. If you study Chinese and have an iPhone save your time and skip every other dictionary and go straight to Pleco. The pollution in Chengdu is no joke, and the air quality data published by the US Consulate in Chengdu is considered the most authoritative. This app delivers that information in a beautiful interface, for free. I’ve tried half a dozen other apps which report pollution in China (on Android and iOS) and none of them come close to the level of polish in this app. It shows current air quality values for all major Chinese cities and gives you the option of displaying Chinese government data, US Consulate data, or both. I have mine set up to show current US Consulate data for Chengdu pollution as it compares to Beijing and Guangzhou. On days that it’s really bad, I think twice about cycling across the city. At one time the pollution level dictated whether or not I wore my Respro mask, but now I wear it whenever I cycle anywhere. Ads appear inside this app, which can be removed by donating a dollar. I hate ads so donating a dollar was a no-brainer. The app which connects you to one of the largest marketplaces in the world. You can find virtually anything on Taobao and have it shipped straight to your door. On Taobao I’ve bought things that would be difficult or impossible to find anywhere else in China – a Japanese coffee grinder, Sriracha hot sauce, Hormel bacon, and much more. Since dozens or hundreds of vendors are competing for the same customers, you will find the lowest prices on Taobao. Here’s why the iPhone app rocks: it doesn’t have any of the bloat of the actual Taobao website. If you have online payment processor Zhifubao configured (think Chinese Paypal), you can send payment via the Taobao app with a few taps. Your mailing address is saved with your account info and you won’t need to do anything else. You should exercise caution when purchasing items on Taobao, but I have never had a problem after purchasing from dozens of vendors. Search results can be organized by “reputation” (rén qì ??) and there are numerous buyer-protection systems present on Taobao. The iPad version of the Taobao app was updated recently and it’s outstanding. The Taobao website follows most of the Chinese web design guidelines – many advertisements, constant popup windows, and hundeds of links per page. You’ll have to send payment using Internet Explorer. Once you have the Taobao app installed, you might not want to visit the Taobao website again. You probably already know that Weibo currently dominates China’s social network landscape. 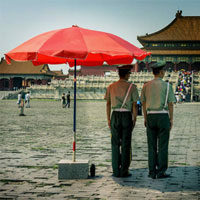 Everyone is on Weibo, and much of the meaningful discussion on China happens here. What you might not know is the official Weibo app is completely outclassed by a third party client called Weico. Weico features a level of polish that you won’t find in the official app. Aside from the app being free, it features a handful of different themes you can select as well as some paid themes. All of the essential Weibo features are here, and Weico features none of the bloat of the actual Weibo website. Hooray. If you’ve used WhatsApp before, WeChat (called wéi xìn ?? in Chinese) is basically the same thing, with a few additional features. Send voice messages, images, and more to friends no matter where they are, for free. The power of WeChat is that since it’s available for iOS and Android, almost everyone is on it. Since everyone is on WeChat, I rarely even send or receive calls and text messages. WeChat is just better. There’s a “find people near me” feature that allows you to stalk – sorry, befriend – nearby strangers. WeChat supports animated GIFS and allows you to import them. Hilarity ensues. Apple Maps – a lot of attention was drawn to the deficiencies of Apple Maps earlier this year when it was released, but Apple Maps in China is solid. This is because the map data is licensed from a Chinese company called AutoNavi. Anything I’ve missed in this list? Let me know in the comments below. I’m not very knowledgeable on must-have Android apps for expats in China, but share that info if you have it! I think you deal with different foreigners than we do, in general, also you created that app 😉 so it’s natural that you’ll be seeing it. I really couldn’t say. But I am fairly certain that I personally do not know anyone who has that app installed. Before writing this post I consulted with friends on what apps are useful to them in China and the Taxi Book app never come up. I tried it a year ago (Dieter gave me a promo code to download it for free) and found the location information to be out of date and inaccurate aside from the app itself being very expensive. If the app were free (like every other app on this list) it would perhaps be worth a mention, but my thoughts largely echo the iTunes reviews. Not really a fan, sorry Peter. I know a heap of expats in Beijing who have the taxi app, but they’re all first time Beijingers who don’t speak any Mandarin, which might have something to do with it. And that’s the same demographic that uses the app here – a growing group of people as far as we can see. That makes sense. I rarely run into first-timers in Chengdu who speak no Mandarin. I tried so many dictionaries before finally breaking down and getting Pleco. KDict+, Nciku, iCED, Hippodict, Dianhua, etc. Pleco is far and away the best though. There’s a major update coming soon with a total redesign I’m told, too. +100 for Pleco. That ought to be standard issue for foreigners in China. On Android, I’d recommend Hanping Camera as the OCR of choice. It’s easier to use than Pleco, IMHO, also cheaper and the recognition is at least as good. Hanping Dictionary has a cleaner UI than Pleco too. Plecos advantage is that it supports loads of dictionaries. But it’s settings are ridiculously complex. Would be good to see a list for Android. Just because the ios list apps have Android versions, does not mean the Android list would be the same. nice list, i know u are an Apple man (I was there for the conversion) but could you do a similar post for Android phones sometime?Would be interesting to see if there are any differences and the links to the dwnlds would be awesome. Many of the apps listed above have Android versions, including WeChat, Taobao, Pleco, and Weico. The pollution checker that I use isn’t available on Android but there are alternatives which are functionally similar. Search for China pollution and those will turn up. I currently use Pleco just as-is and it currently just serves as a standard dictionary. However I didn’t know about the add-ons and customization options. Could you share some knowledge and experience as to which add-ons are worth paying for. That OCR seems pretty useful. The bare-bones Pleco works as a Chinese dictionary, but the add-ons are what make it really excel. Functionality like: intelligent flashcards, OCR, different dictionaries, audio pronunciation (male and female), full-screen handwriting, stroke order diagrams, and the document reader. I purchased a handful of those but one that I use almost everyday is it he document reader. It allows you to open and translate documents (as the name suggests) but I use it for translating things copied to the clipboard. Here’s an example: I’ll get a text message with a phrase that I can’t understand, so I’ll copy it to the clipboard, open Pleco, and go to the pasteboard reader. The text that I copied is there, and I can tap on any of the characters to see the definition and pinyin. Best of all, I can add any of these to a vocabulary list for later review, in the form of flashcards are not. Through this method, manually entering Chinese, and scanning characters that I can’t read, I’ve assembled vocabulary lists with thousands of words. This is how I’ve advanced my Chinese over the last 2 years, basically. i also use google translate to help with text messages that are hard to read at times or write a chinese email real quick. New Google maps is nice with turn by turn directions even for Chengdu. Nimen hao, I would strongly recommend TaxiBook for newbies in China! It’s a great app that will lead you anywhere you want. Specially if you know that Chinese TaxiDrivers hardly speak English (although this is changing) and if you pronounce the name of a hotel/restaurant/street/… in ‘our’ language … they will also not understand since the Chinese will transform the name to a Pinyin-version. We, laowai from Volvo, used (and still use) it a lot! Just to be complete … the ‘loading’ of the app could be improved a little! 🙂 Best regards, Patrick. It has been said before, but since Android is more popular than iOS here in China (at least, in terms of devices produced/sold), wouldn’t it make more sense to do a post for android softwares ? Also, how about Google Maps, Translate ? iOS is where I’m really knowledgeable and can write an authoritative guide, so that’s where I will naturally lean. Most of the apps that I selected for this list are available on Android as well though, so approximately 90% of this article applies to Android users. Google Maps gets the job done but Apple Maps is superior in China, since the map data is from a Chinese company as mentioned. Google Translate is similarly eclipsed by Pleco and its pasteboard reader in my opinion, although it only translates from English to Chinese. However if you aren’t actively learning Chinese and just want to translate something, Google Translate will work better in that case. At least Google Maps has bus information. I am curious why Apple Maps thinks that everyone drives their own car. It rudely landed on my iPod Touch towards the end of last year .. anyway, you get my drift. Any thoughts to offer a dedicated bus user? Interesting that you mention that. I had always noticed a bus icon in Apple Maps along with the pedestrian and automobile icons so I figured bus directions were there, I just never used them. 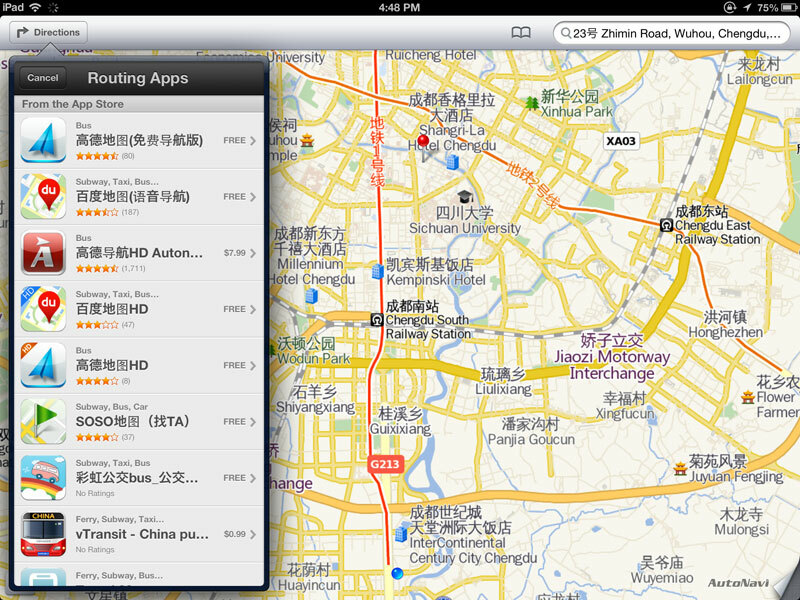 Now that I try, I see that a list of apps with bus directions comes up, Baidu Maps among them. You could use any of the alternatives for bus directions, either Google Maps or Baidu Maps if you’re comfortable searching entirely in Chinese. I took some screenshots to show you what I see. This one shows the bus icon and this one shows what happens when I tap on the bus icon. Charlie, Thanks for the tip on Baidu Maps, will try that on my phone. Thanks for going to the trouble of posting those screen shots; they are the same as I got. Google Maps has bus stops and bus routes ON the map itself, that’s what I’m saying, very convenient. Quick and easy to use, just read it. I’m probably badly missing something here – and I am probably wasting your time – but I still don’t see how Apple Maps works. It gives me several ‘routing apps’ options, one of which (Google Maps) I already have loaded. Is Apple saying “I don’t think we’ll bother, you can get a separate app to look up bus routes.” In fact, “get Google Maps” it says. Apple Maps does not actually give me any bus information at all, does it – I am better off going straight to Google Maps, right? I thought when I pushed the Google Maps option it might give me the information I need – it doesn’t. It just sends me to the Apple Store, for something I already have loaded. For what it is worth I will use anything that gives me the information that I need. The car route works fine in Apple Maps; it gives me a route from point A to B. I can’t get the pedestrian option to work, and the bus one … just takes you to the App Store. I know what you mean – if you’re looking for bus route information, just skip straight to Baidu or Google Maps. I assume the reason why they included a bus icon and then recommendations to other apps for that is because their bus routing information is incomplete. At some point I imagine it will have that functionality built in since there’s already a position for it within the interface. Got it – thanks for clearing that up. In the meantime I keep both loaded (and Baidu Maps makes three). I have been using nciku and didn’t feel the need to look for another dictionary but since pleco get such good responses here I might give it a try. The Nciku website is incredible and I had really high hopes for the Nciku app. Unfortunately it failed to meet the production quality of the website. I haven’t heard of FooDragon before but I’ll check it out, thanks for mentioning it. Great tip about Pleco’s document reader, Charlie – I will give it a go. I reckon Pleco’s full-screen handwriting add on is also essential, so much easier. Ps. I think the Anki 2 app for flashcards is pretty good. What do you reckon? I haven’t purchased the full-screen handwriting add-on because I don’t do much manual character input, but that is a great one. It’s remarkable when a third party developer can beat Apple’s own character input, but Pleco has done it. Anki had such a high reputation that I purchased it on iOS even though the price was really high – I think $14.99? I was disappointed. It has a lot of features but Anki requires a lot of fiddling. The entire system was frustratingly obtuse compared to Pleco which is a more elegant all-in-one solution. If you go with Anki you’ll be juggling several different apps for vocab list creation and review whereas with Pleco it’s all in one system. In my experience this means more time learning the language and less time wrestling with the tools. I’ve been using 4 of the 5 for a long time now, but haven’t felt the need to pay too much attention to Weibo or it’s relates apps so far, though I’m well aware of it’s overriding popularity in China. WeChat is an awesome app for keeping in touch with Chinese friends, wherever they happen to be. I’ll have to revisit Pleco after reading this. I’m often translating in google, though it has a habit of being temperamental (usually when you need it the most), so the pasteboard feature in Pleco sounds extremely useful. The Pasteboard in Pleco blows away Google Translate if you’re interested in learning what you can’t read. For a quick translation though, the latter more or less gets the job done. Wait… There is an English version! Thnx for publishing this – very helpful for learners! Hope I’m not out of line asking this here, but I am a relative beginner to Mandarin and I’m wondering if anyone knows of a good app for the iPhone to enable texting in characters instead of pinyin? Don’t mean to seem so ill-informed, but I’ve looked and asked and so far come with nada. Thanks in advance. You don’t need to install anything on your iphone. Just go to settings -> general -> keyboard -> international keyboards -> choose Chinese simplified or Chinese traditional -> choose handwriting or pinyin. 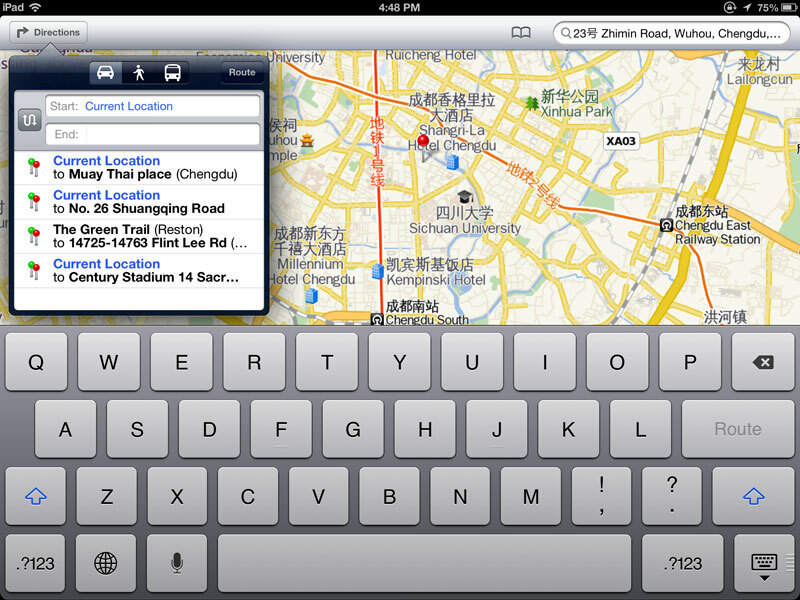 That’s all you need to add Chinese input to an iPhone or iPad. Oh, I made a similar list of apps I thought were important too! Glad we agree on Pleco, Air Quality China, and WeChat. I’m ashamed to admit that I’ve never heard of Weico so thanks for the info! Weico and Weibo in general are a little passé now, in 2016. People still use Weibo but when this post was published Weibo was the go-to social network in China and now WeChat has essentially buried Weibo in terms of popularity and ubiquity. I have study a few perfect stuff right here chicago. Seriously worth social bookmarking pertaining to returning to. My spouse and i shock the fact that whole lot attempt you set to make these kinds of fantastic educational site.